Rose Cottage, a photo by megan_n_smith_99 on Flickr. "Who said," lashed out Isaac Penn, "that you, a man, can always perceive justice? Who said that justice is what you imagine? Can you be sure that you know it when you see it, that you will live long enough to recognize the decisive thunder of its occurrence, that it can be manifest within a generation, within ten generations, within the entire span of human existence? What you are talking about is common sense, not justice. Justice is higher and not as easy to understand -- until it presents itself in unmistakable splendor. The design of which I speak is far above our understanding. But we can sometimes feel its presence. I've also got some new hats on Etsy. Through the end of the day Monday, take 15% off in my Etsy store w/ coupon code NOV2012. I hope you had a wonderful and peaceful thanksgiving! Well Dressed, a photo by megan_n_smith_99 on Flickr. I hope you all had a wonderful Thanksgiving, if you are in North America. I enjoyed times with friends, including my mostly adorable little god kinds, who were not QUITE on their best behavior as a result of excitement and pie. No one got hurt, and no parents last their minds - quite. Zazzle has lots of deals today - 50% off ornaments, 30% off mugs, 20% off tote bags, $10 off electronic sleeves and covers, and more. use code BLACKFRISALE and visit my zazzle shop!. & I am still having a sale on Etsy too, see my previous post for info on that. Sunset Roses, a photo by megan_n_smith_99 on Flickr. For my readers in North America - happy Thanksgiving! I hope your holiday is peaceful and relaxed. I am wondering when the holidays became synonymous with stress. Were they 100 years ago? 200 years ago? Well, a peaceful holiday is the best thing I can think of. Birds of Paradise, a photo by megan_n_smith_99 on Flickr. I've come down with the latest in my 2012 set of cold / flu-like viruses, though at least this one is not too bad, provided I don't do anything more strenuous than lie in bed and turn the pages of books and ebooks. And it's absolutely pouring, so who wants to go outside anyway? Well, I need to go to the post office later but I am wearing my rain boots. In Seattle, especially if you don't have a car, a good pair or rain boots is a necessity, not an accessory. In other news, I've opened a Zazzle Shop, where you can purchase items such as mugs and tote bags with my art on them. Could make good holiday gifts? I think I may now need to retreat into the biography of J. M. Barrie I am reading. Well, i thought it was a bio of J. M. Barrie (author of Peter Pan), but it seems to have veered off into talking extensively about the lewelyn Davies boys, who served as a model for Peter Pan, and their grandfather George du Maurier, author and cartoonist for Punch magazine, and their 1st cousin Daphne du Maurier, author of Rebecca. I have not read Rebecca, but I ought to. Rebecca won the National Book Award for favourite novel of 1938. Couture Hat, a photo by megan_n_smith_99 on Flickr. I've been creating some one-of-a-kind hand crocheted hats, which I've started listing on Etsy. They are crocheted with mainly with soft merino wool, and some also include silk and mohair. They are each embellished with special trims I've been hoarding - some vintage, some imported from France and Japan. This particular hat is trimmed with 2 vintage velvet flowers, velvet leaves, and a peacock feather. I have several similar hats that I've made for myself and I get compliments everywhere I go. It's nice to have a really good looking hat. If your hat is special then trust me - no one will notice if there is cat hair on your coat or if your shoes need a shine. "A hat is a flag, a shield, a bit of armor, and the badge of femininity. A hat is the difference between wearing clothing and wearing a costume; it's the difference between being dressed and being dressed up; it's the difference between looking adequate and looking your best. A hat is to be stylish in, to glow under, to flirt beneath, to make all others seem jealous over, and to make all men feel masculine about. A piece of magic is a hat." Teapot, a photo by megan_n_smith_99 on Flickr. 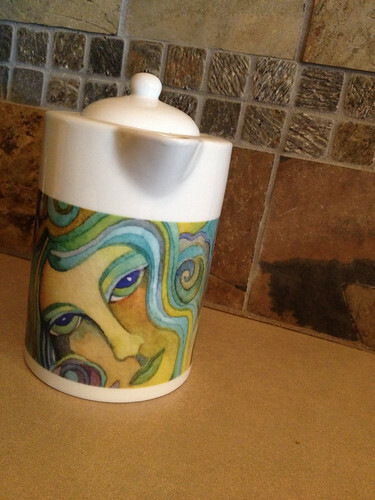 This is a teapot I had made with some of my art at Zazzle for my sister's birthday. It's from a scan of one of my original watercolor paintings. Hopefully I will be offering these for sale soon, if you might be interested. I've been drawing, painting, and freeform knitting & crocheting this week. I think when my visual part of my brain gets going, I have a hard time thinking of anything to blog about, because that's more the verbal & word-oriented part of my brain. Maybe I should just post more pictures and not worry as much about words? What do you think? Do you read my blog for the words or for the pictures or both? Art Journal, a photo by megan_n_smith_99 on Flickr. This is another recent page from my sketch journal. It's got some bits from here and there - whatever I was reading, thinking, etc. at the time. I had just finished re-reading Katherine Dunn's Geek Love. It's a very odd book. But that's not what I am thinking about now. I just watched the 2009 film, Creation, which is about Charles Darwin's struggles writing On the Origin of Species. Chiefly he was troubled by ill health, the death of his daughter, and conflicts between his religious views and scientific investigations - which also lead to strife between Darwin and his religiously devote wife. That's certainly enough to trouble anyone, and he was rather a sensitive person. It's quite sad, really. If he had been born a bit later he may have found religious views a little less strict, and might also have had access to better medical treatments. No one really knows what was wrong with him - it may have been a chronic disease like Crohn's Disease or Ménière's Disease, or it may have been an infectious disease, possibly something he picked up while voyaging on the Beagle, or it could have been a hereditary disease. His daughter Annie had something similar and died as a young girl - though some my have died from TB or scarlet fever. It seems pretty certain that Darwin also suffered from some form of mental illness -- depression and anxiety at least, which exasperated and was exasperated by his physical condition. He also suffered from great guilt at the thought that if the condition WAS hereditary and passed on to his daughter, then it might have come about because he and his wife were 1st cousins. And of course heredity was the subject of his life's work so he could not escape from those fears. I did not realize until after I watched the movie that Paul Bettany & Jennifer Connelly are married in real life - hopefully more happily than the Darwins, though I think that the Darwin's marriage was a little happier than shown in this film. It was just complicated. Martha West was delightful as young Annie Darwin. It appears to have been her only acting role - I hope there will be more to come. The soundtrack and cinematography were also beautiful done, with many shots of the diversity of life. The opening and closing credits featured Christopher Young's piano & violin composition "Creation", which to me somehow captured the many variations on form which Darwin wrote about. :Around 2000, Charles Darwin's great-great-grandson Randal Keynes discovered a box containing keepsakes of Anne collected by Charles and Emma. He wrote a biography of Charles Darwin centred on the relationship between Darwin and his daughter, entitled Annie's Box; the script of the 2009 film Creation is based on the book." This is one of the recent pages in my big art journal. I've started a mini one - classic moleskine sketchbook that i am going to try to fill in November - sort of artist version of NaNoWriMo - National Novel Writing Month. I hope I can get it done - we'll see. I am not feeling very well today. I did this page a week or two ago and the title is an odd juxtaposition against what become the title of this page - Starting to be & Neverwas? Yesterday I rewatched a movie that I think is under-rated. It's called Neverwas. It was in the Toronto Film Festival but then for some reason never had a theatrical release - just went straight to DVD. For anyone who has ever fallen in love with a book or tried to heal through art and imagination. I also found this website done by Matthew Cogswell, the production designer. The visuals were impressive. I have seen this movie twice already and I am sure I will watch it again something. It's on Netflix instant right now.